As I have already referred to above, I attended a Council for Disabled Children (CDC) conference in January 2017, entitled: ‘SEND: New Challenges, New Opportunities’. We heard from a selection of speakers including, amongst others, people from the Department for Education, from NHS England, from the SEND Tribunal, and from Ofsted/the Care Quality Commission (CQC). It is always interesting for me to hear perspectives and information by people from other disciplines, such as health and care, rather than only from the area which I know best (i.e. education). I am also grateful to CDC for letting me/all delegates have a ‘goody bag’ to take away, which included a number of resources they had produced, including guides to relevant issues and examples of good practice. The Autism Show 2017 at Excel, London on 16-17 June 2017; at the NEC, Birmingham on 23-24 June 2017; and at EventCity, Manchester, on 30 June-1 July 2017. As seems usual now, I will again be speaking this year at the Jordan’s Conference. 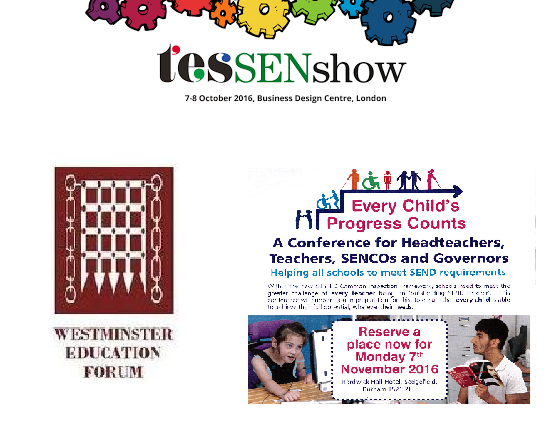 My presentation this year is entitled ‘All That Glitters Is Not Gold’ and I am using it as a chance for me to help people take stock of where we are, now we are well over halfway through the transition from the old SEN framework to the new SEN framework (which began in September 2014 and is due to be completed by April 2018). ​If you are at one of these events and see me, please say ‘hello’ if you can.